Closed Weekends and on Monday, January 16, Thursday, January 19, and Friday, January 20. 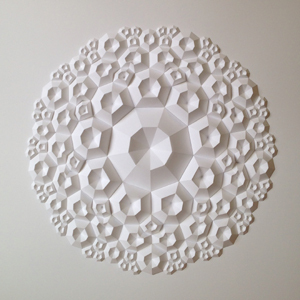 Matthew Shlian is an artist and designer working in paper. Shlian's work exemplifies the dynamic problem-solving nexus of art and science. He uses the traditions of origami, kirigami, and paper engineering to transform flat materials into 3D sculptures and in collaborative research with scientists at the University of Michigan, Ann Arbor. While origami is widely known as the art of paper folding, kirigami extends it by integrating paper cutting and can result in increasing a material's flexibility and functionality. Shlian collaborates with scientists who are applying kirigami techniques to the development of innovative mechanisms that would enable solar cells to move and track the sun. The title of this exhibition, Chirality, refers to a property of asymmetry important in several branches of mathematics and science including genetics and biochemistry. It describes something that is not superimposable onto its mirror image. Chirality plays an important role in Shlian's Ara series, establishing rules that dictate pattern arrangement. The series is rooted in Islamic tile design and forms found on the nanoscale from self-assembly systems. Shlian says of his partnership with engineers, "there's a symbiotic relationship between the work in the studio and the work in the lab. The scale shifts from nanometer to folded paper and then back again. Each time, knowledge is gained and new questions emerge."